The latest versions of Safari in iOS support new keyboard shortcuts to help speed up web browsing and general web navigation for iPad and iPhone users that have external keyboards attached to their devices. Those who have memorized the keyboard shortcuts for Safari on the Mac will find these to be identical to their Mac OS X functions, except they’re in the highly mobile iOS world. These will be primarily useful for an iPad with an external keyboard connected through Bluetooth or a keyboard case, but technically they’d work with an iPhone or iPod touch that has been connected to a secondary keyboard as well, if you happen to use a much smaller screened setup. Requirements are fairly straight forward, needing a modern iOS release, and one must have a physical keyboard synced to the device for the keystrokes to be available, as the onscreen virtual keyboard does not (yet) offer this type of functionality. * The Command+L keyboard shortcut goes to the URL bar, but is also used to perform a “Search on Page” like you would in new versions of Safari without a keyboard attached. It’s a little quirky to get used to, going a bit like this: hit Command+L to visit the Safari URL bar, then start typing the text to search and match on the currently active web page for, finding the matched results below everything else on the list, below all the other keyword matches, found under the “On This Page” section. Search On Page is incredibly helpful and widely used, and this could use some improvement in upcoming versions of iOS, whether you use an external keyboard or not. Of course, iOS keyboard shortcuts are not limited to Safari, and there are actually quite a few core iPad keyboard shortcuts and commands which cover everything from switching apps, navigating the iOS dock and multitasking screen, launching apps, using the Home button, and even moving around and selecting onscreen elements. Many users think of the iPad as a primarily consumption orientated device, but once you learn a few keyboard shortcuts and attach a wireless keyboard, it can function quite well for emailing, web browsing, writing, and many other tasks that don’t require a complete windowed desktop-centric computing experience. One preferred productivity trick I use is to set an iPad against something at eye level while standing, and use it to setup a quick standing desk workstation, which can not only aid productivity for many tasks, but is also much healthier than sitting constantly. Even if you only use such an iPad setup for selective web browsing or sending off quick emails, it’s a good start at not only bettering your health but also getting used to the iPad as a unique production environment. These new Safari keyboard shortcuts were discovered by MacStories, along with a handful of other handy keystrokes accessible with external keyboards when used with the iOS Pages app and Mail app, be sure to check those out on MacStories too. 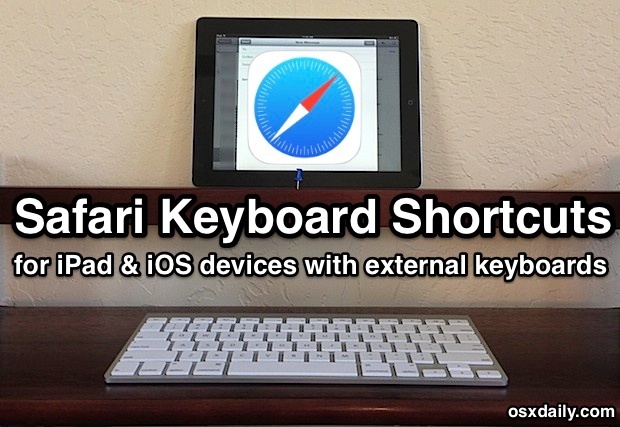 Find any other keyboard shortcuts for Safari in the iOS world? Let us know in the comments. command left bracket – go back to previous page in Safari and command right bracket – go forward. These do NOT work on an iPhone. I wish they did..